This video shows off some of the VR headset prototyping I did this week. I built 2 cardboard headsets. One is a Google cardboard I made myself, and the other is a dodo case. 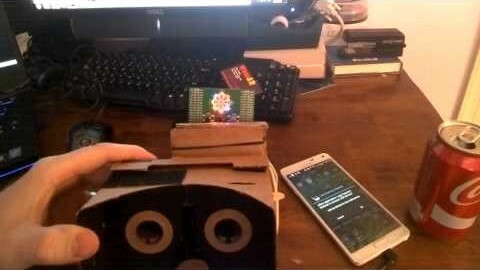 To these I added an ST Micro Discovery board which emulates the Samsung Gear VR headset, and you can make and use GearVR apps with the cardboard once you get it set up! I also made them Leap Motion compatible, and guess what you can run it all from your phone! I ported my integrated Lunar Demo to both Gear VR – using Samsung/Oculus SDK – and cardboard – using the Durovis Dive SDK. Many thanks to the guys at open-gear.com for their instructions about how to set up a the do-it-yourself GearVR.